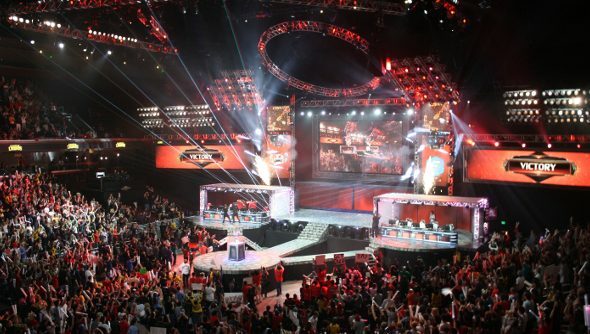 HBO’s Real Sports corrospondent Soledad O’Brien stepped into the world of e-sports and League of Legends recently, with her report airing a couple of days ago. Instead of being a woefully misinformed look at the sport, the likes of which mainstream media would have thrown out there only a couple of years ago, it’s littered with interviews with the likes of Scarra and Riot’s Dustin Beck. By the end of the piece, O’Brien acknowledges just how massive e-sports have become, and there’s undoubtedly admiration there. She even quickly defends Scarra’s LoL handle when Bryant Gumbel struggles to take it seriously. The report unfortunatly gets off on the wrong foot by perpetrating the classic, trite characterisation of League of Legends players. “[T]his is the day when William Li [Scarra] and all those like him, often derided as anti-social shut-ins, let’s be honest, nerds, are going to step out into the real world and finally demand some respect.” While it’s clear that O’Brien is not dismissing Scarra or anyone else as a shut-in or a nerd, the trope of the basement dwelling gamer doesn’t really deserve a mention. The rest of the segment focuses on the hard work that goes into becoming a professional e-sport athlete, with O’Brien being shown around the home of an amateur team attempting to make it into the big leagues, living and working together to achieve their lofty goal, and emphasises the similarities e-sport shares with its older sibling, from the athlete visas in the US, to the huge fan base and the potentially lucrative earner that making a career out of LoL can be. There was little in the report that those familiar with LoL or e-sports in general wouldn’t already be aware of, but informing those outside of gaming was the intent of the piece. The whole thing was very “us vs. them”, with “us” being the viewer and “them” being those who are making LoL bigger than American Football. If you want to watch the whole thing, I’m sure you’ll be able to find it floating about online.